12 buku warna-warni yang dikhususkan bagi pembaca usia 3-6 tahun. Anak-anak dipekenalkan dengan konsep dasar, seperti warna, suara, waktu, angka, huruf dan bentuk. 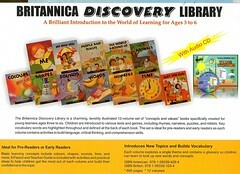 The learners Discovery Library is a charming, lavishly illustrated 12-volume set of �concept and values�books specifically created for young learners ages three to six. Children are oiintroduced to various text and genres, including rhymes, narrative, puzzles, and riddesl. Key vocabulary wprd are highligted throughout and defined at the back of each book. The set is ideal for pre-readers and early readers as each volume contains activities to build language, critical thinking, and comprehension skills. Basic learning concept include clours, shapes, shound, time, and more. A Parent and Teacher Guide is included with activities and practical ideas to help children get the most out of each volume and build their confidence in the topic. 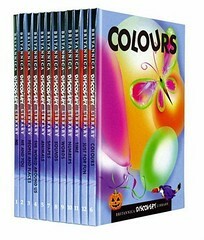 Each volume explores a single theme and contains a glossary so children can learn to look up new words and concepts.